Are you a huge Star Wars fan? If that is the case, surely you would love collecting different kind of merchandise associated with the space opera that spans across 6 movies, inspiring a ton of other merchandise over the years as well. 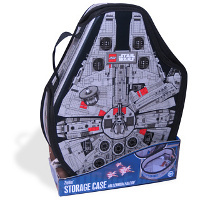 You might as well add this to the super long list – the £14.99 LEGO Millennium Falcon Storage Case. Yes sir, you know that this is touted to be the fastest ship in the galaxy by the Captain himself, the legendary Han Solo, and we would expect the kind of cargo it carries to be worth some value – otherwise Han would not even bother. Having said that, I am quite sure whoever purchases this also wants to stash away their valuable items within, especially for kids. Inside, there is enough space to hide away 23 actual LEGO Star Wars characters, who are located in pockets all around the edge. In addition, there is also an entire area dedicated for playing or if most moms have their way, to store your packed lunch within. There is enough space inside to hold up to 200 LEGO bricks.